The Erratic Clutch Deluxe is a unique effect pedal kit that gives you fuzzy square wave distortion as well as a monophonic sub-octave square wave using a total of only four transistors. The two signals can be used individually or mixed together for a raw and sonically rich synthy output. Full of character and quirk, this pedal will give you a truly original sound. The middle knob is the bias control. 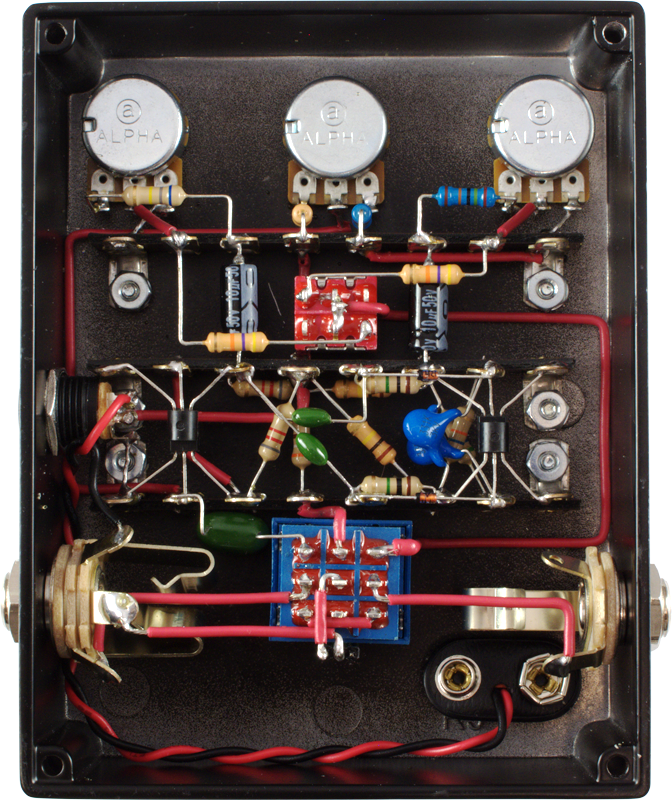 This adjusts the pulse width in the initial fuzz stage of the pedal. Set this knob to fit your pickups and playing style. The closer to the center the longer the note will sustain but with that comes more chaotic tracking for the divider. Moving it more clockwise or counterclockwise will give you more predictable note tracking on the divider with less sustain. The middle will have a small area where the gating opens and noise comes through(position may change when using a battery).This is a good area to start and then slowly dial the knob away in either direction to find your sweet spot.